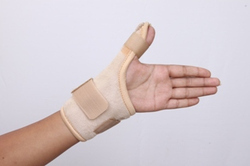 Pioneers in the industry, we offer thumb spika splint from India. Manufactured in accordance with the set industry norms and guidelines, the offered Elastic Thumb Spica is of optimum quality. The finest raw materials used in its manufacture, render the product an impeccable lifespan and high effectiveness. This product is offered to the clients at the best rate possible and in several specifications. Looking for Elastic Thumb Spica ?